Dukley Gardens offers you the chance to live the Mediterranean lifestyle all year round. Spend your days diving into the crystal clear Adriatic Sea, dining on fresh, organic produce and exploring Budva’s 2,000 year old town. With all the amenities you’d expect at a five star hotel onsite, you’ll never want to leave ‘The Island’. 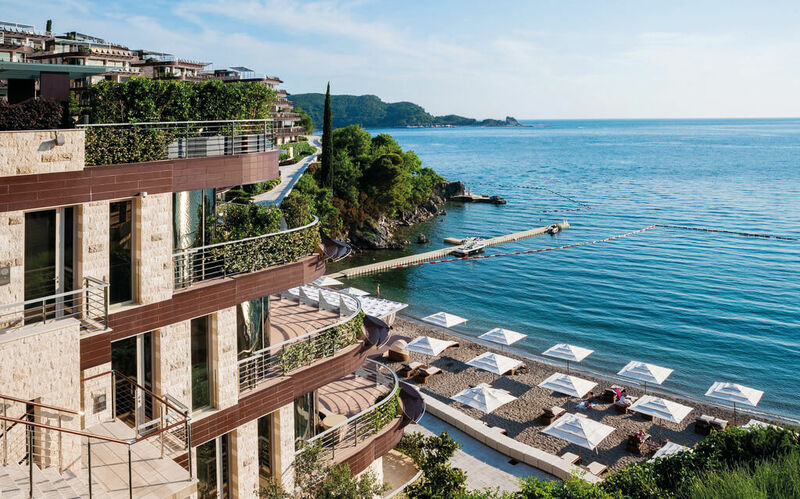 Montenegro’s Mediterranean climate, laid-back atmosphere and stunningly beautiful mountain and sea vistas make it an attractive destination for those of us who’ve discovered it. In fact, Montenegro’s been one of Europe’s best kept secrets for years. Summers spent splashing in the balmy Adriatic Sea. Long evenings with friends, lingering over fresh-caught seafood, organic produce and fine wine from the Balkans’ best wineries. Close-knit communities where children roam in safety. A simple and carefree lifestyle. But there’s a place in Montenegro where you can find all of this: Dukley Gardens. I spent a weekend there living the Dukley Lifestyle to see what’s it’s like. 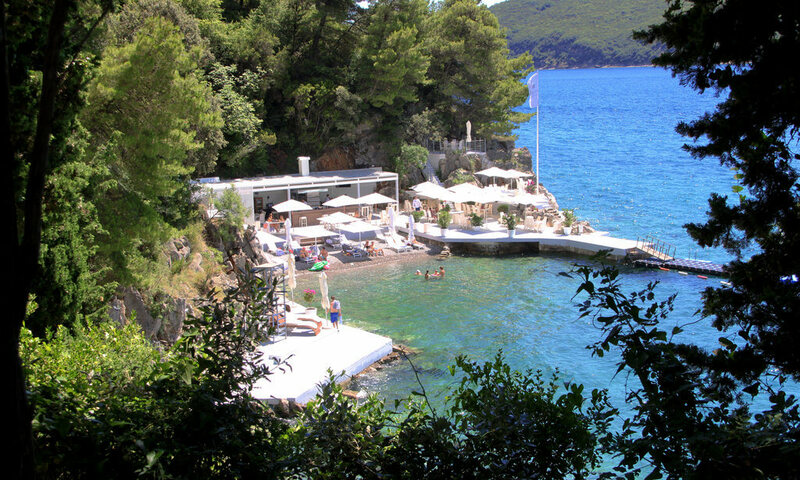 ‘The Island’, as it’s known by residents here, is situated on Zavala Cape, between Slovenska and Becici beaches on the Budva Riviera. 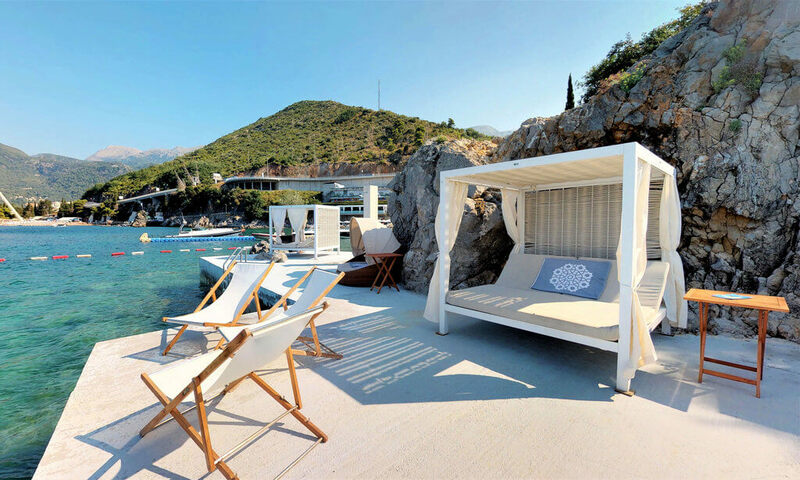 It’s just 3km from Budva’s 2,500 year old old town and has views of both the old town and Sveti Nikola Island. Dukley Gardens is aptly named. 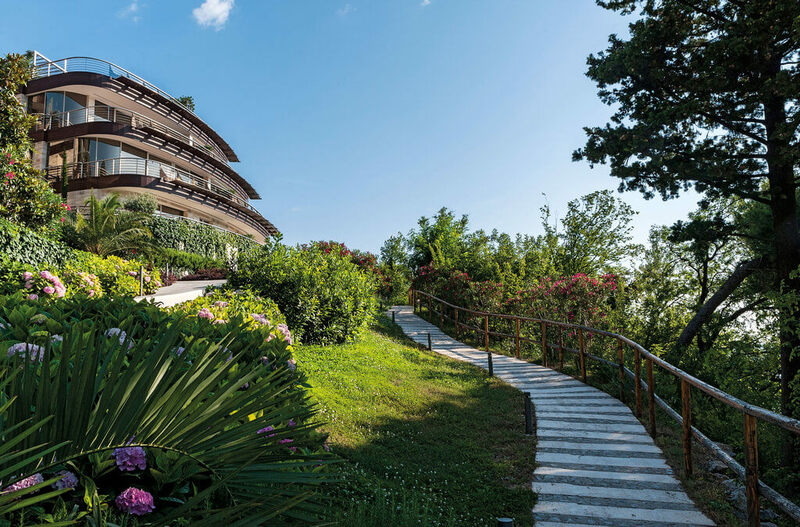 Lush gardens fill every spare space, balconies and stairways are lined with creeping ivy and the scent of pine forest permeates the air. The only sounds are the waves lapping on the shore and birds chirping. Since the complex is only open to residents and hotel guests, the only other sounds are of residents making their way down to the beach. 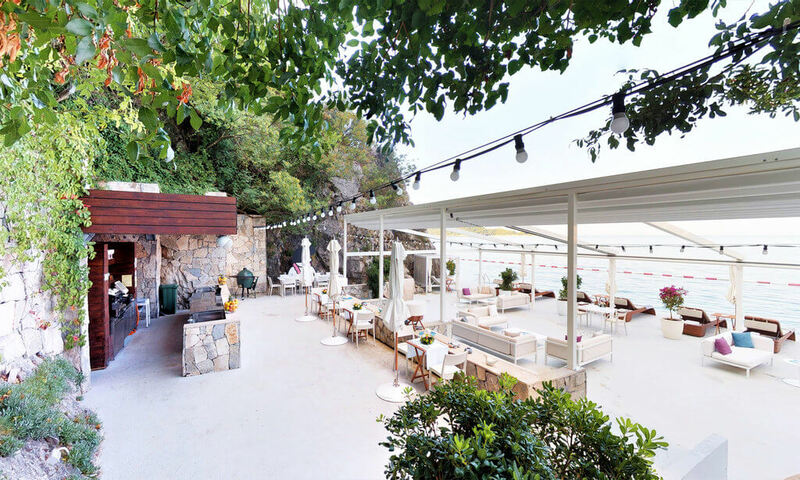 For a place on the beautiful, but busy, Budva Riviera, it’s a surprisingly peaceful sanctuary. The sense of community at Dukley Gardens is palpable. 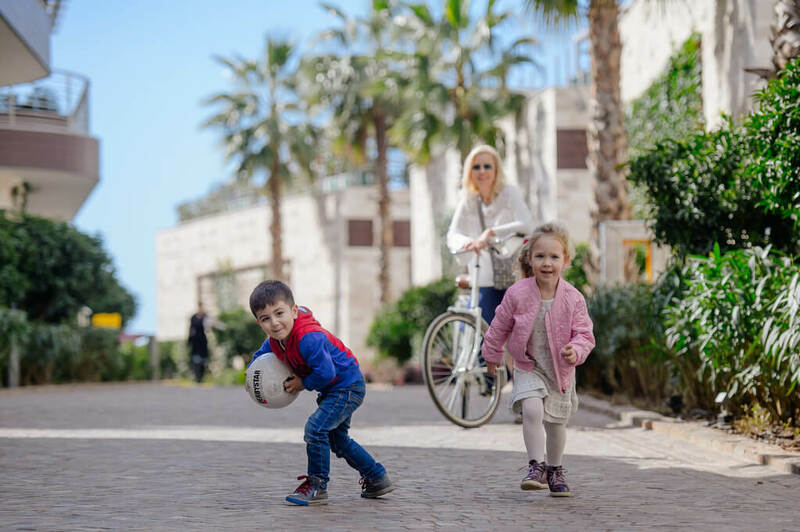 Residents greet each other as they walk the paths between villas, and breakfasts turn into brunches as neighbours bump into each other in Dukley Beach Lounge and catch up while their children play on the beach below. With beaches, restaurants, school, kindergarten, medical facilities and even an art studio, the complex has everything residents need to live here either part time or year round. Dukley Gardens can even handle the rental of your property while you’re away, making a home here a good investment opportunity. Dukley Gardens is home to just over 200 beautifully appointed apartments and penthouses which cascade down the hill towards the sea. 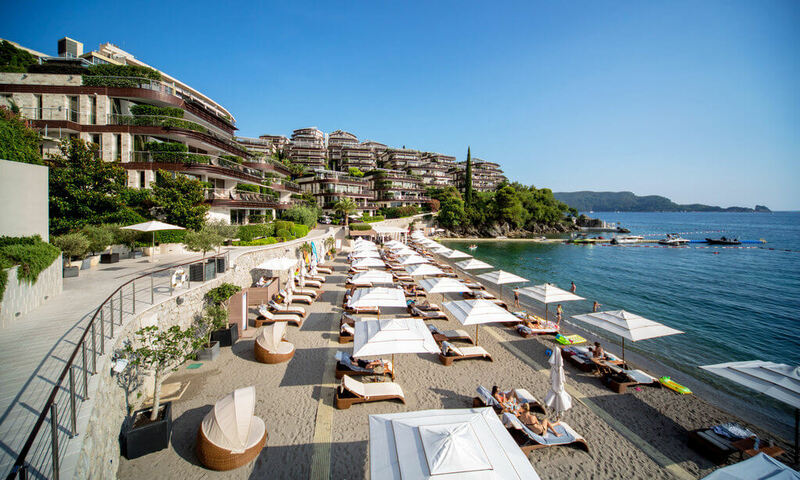 The island has stunning views of the Budva Riviera that encompass the old town, Slovenska beach and Sveti Nikola Island. And the sunset views you get from the terrace are simply breath-taking. 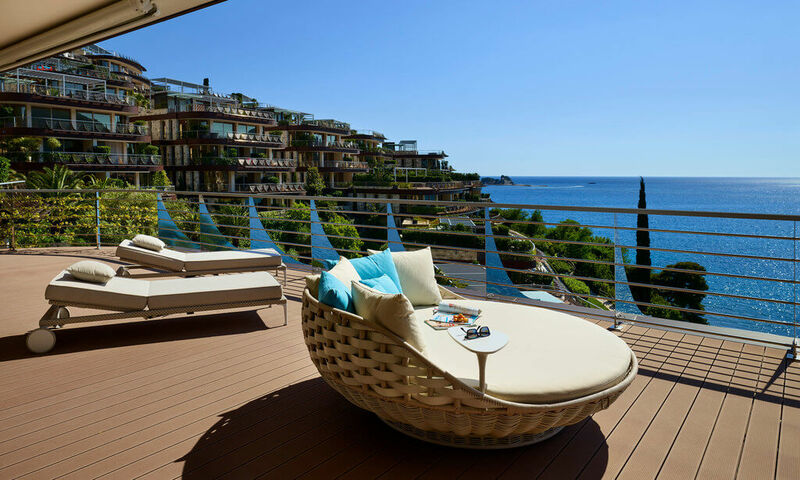 Each apartment includes a generous terrace so you can make the most of the Mediterranean climate, and select properties have whirlpools and even huge rooftop terraces. Floor to ceiling windows allow you to bring the outdoors in and make the most of those stunning views year round. The homes are built to the highest international standards and range from 80m2 to 535 m2. 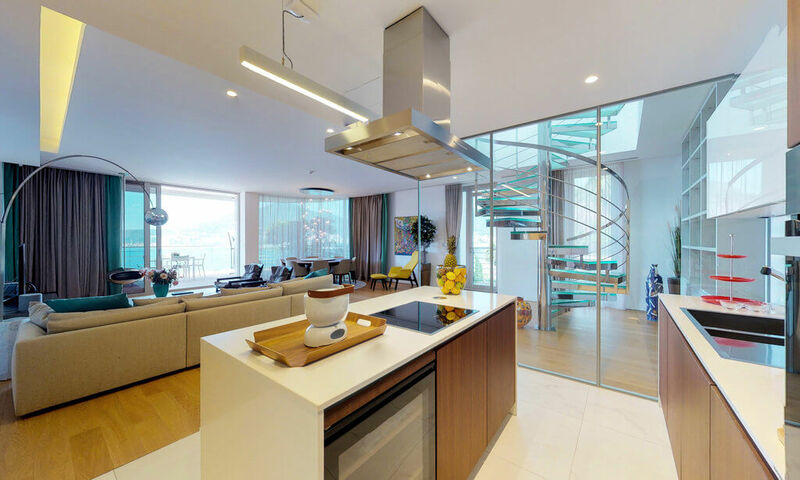 The design is open plan and airy, perfectly fitting the seaside location. All homes come equipped with smart home technology, luxury Villeroy and Boch fixtures, Miele appliances and premium finishes. Download a Dukley Gardens brochure at the bottom of this page. There’s no need to leave the sanctuary of Dukley Gardens if you don’t want to. The Dukley Gardens motto is ‘If there’s a reason for you to leave the island, we’ll bring it here.’ And the team and Dukley Gardens will do everything to ensure you, as a homeowner, have everything you desire onsite. Moët and Chandon Beach is the perfect sandy beach that’s ideal for couples and families with young children alike. Laguna Beach has crystal clear waters that are perfect for snorkelling and watersports. The Laguna seafood restaurant is where homeowners can enjoy candlelit seaside dinners as the sun goes down. Key West Beach is a casual concrete pontoon beach that offers complete privacy and an adults only place to relax with a beer and barbecue. It’s also transformed into an outdoor theatre for movie nights and a private location for special events. Dukley Beach Lounge serves top quality breakfasts, lunches and dinners year round. Laguna Beach Restaurant is a seafood restaurant on Laguna Beach. Key West Beach Restaurant is where you can get a casual beer and barbecue in an adults-only setting. Dukley Gardens has its own art studio where residents can take part in, or run, workshops and network with other artists. Dukley Academy is an onsite school for international students. It offer Russian, English and Montenegrin curriculums and offers an environment where global children, who are often bilingual or trilingual, can flourish. Kuca Mala is Dukley Gardens’ onsite kindergarten for 2-7 year olds. The incredible location and philosophy of the kindergarten means children spend ample time outside in the sun and sea, developing through hands-on, play-based learning. Dukley Hotel and Resort is a five star hotel that’s part of the Dukley Gardens Complex. 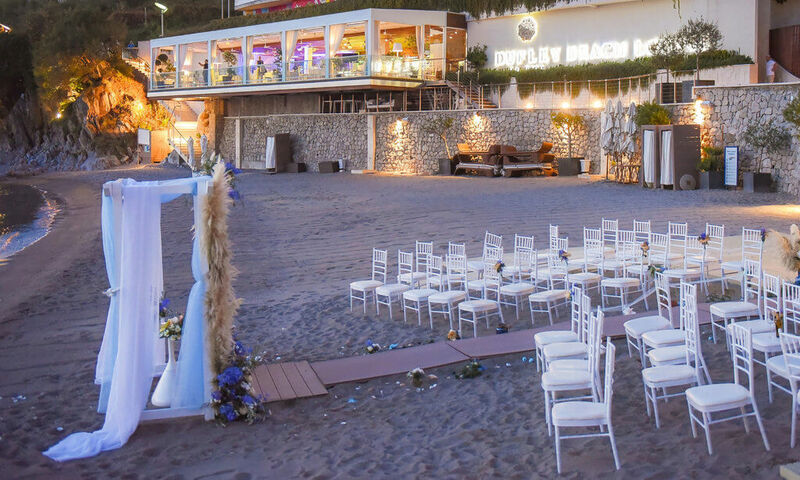 Dukley Gardens is a stone’s throw from the lively resort of Budva, where you’ll find a bustling old town, high-end shopping, restaurants, beaches, night clubs and water park Aquapark Budva. It’s also within easy reach of some of Montenegro’s top attractions, like Skadar Lake, the Bay of Kotor and Durmitor and Biogradska Gora national parks. Situated in central Southern Europe, Montenegro is a short flight from all European centres. 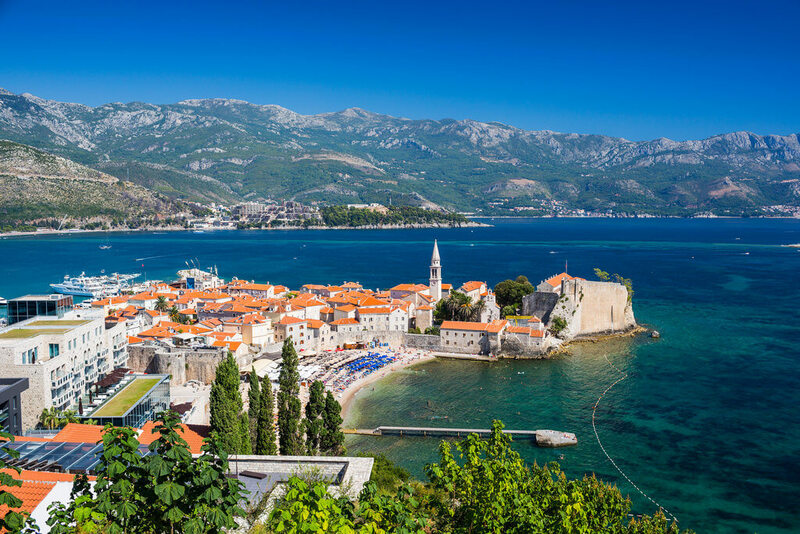 There are also three international airports you can fly into to get here: Tivat, on the coast, Podgorica in the capital city and Dubrovnik, just across the border in Croatia. When you become a homeowner at Dukley Gardens you have the option of renting your home when you’re not using it. The professional management will take care of everything for you, including marketing, maintenance and key handovers. It’s easy to see why Dukley Gardens is a popular choice for investors and people wanting a quality home in sunnier climes. The Dukley Lifestyle is about idyllic as you can imagine: endless days on pristine beaches, long nights spent with friends, enjoying excellent food, fine wines and a sunset view that never gets old. It’s the kind of place where life is slowed down and simplified to those priceless things that really matter. And yet you’re left wanting for nothing. Everything at Dukley Gardens drips with quality, luxury and attention to detail. The staff there anticipate your every need so you can spend your time enjoying yourself. When you become a homeowner at Dukley Gardens you’re not just buying a home, you’re buying yourself time. Time to enjoy your life. And that’s really what the Dukley Lifestyle is really about. Enter your name and email address in the form below to download Dukley Gardens brochures. If you’d like to join me in finding your piece of idyll in Montenegro, you can enquire about Dukley Gardens (or any other real estate in Montenegro) by filling in the form below. 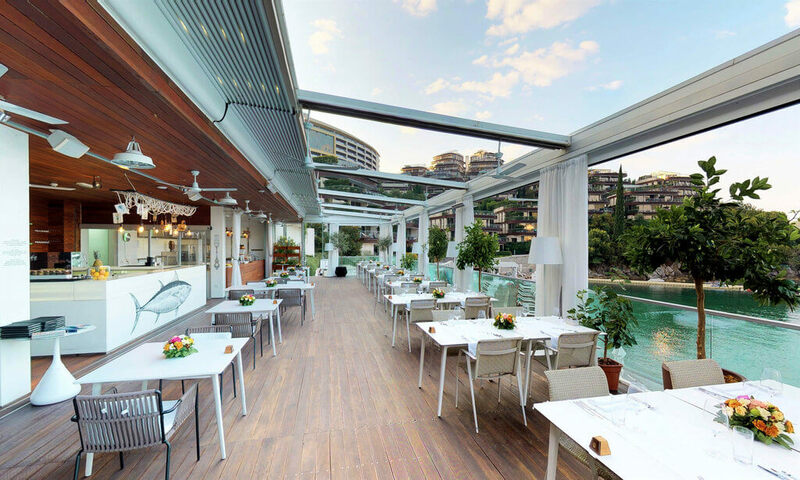 This will put you in touch with my preferred real estate agent in Montenegro, Milorad from Montenegro Coast Real Estate. 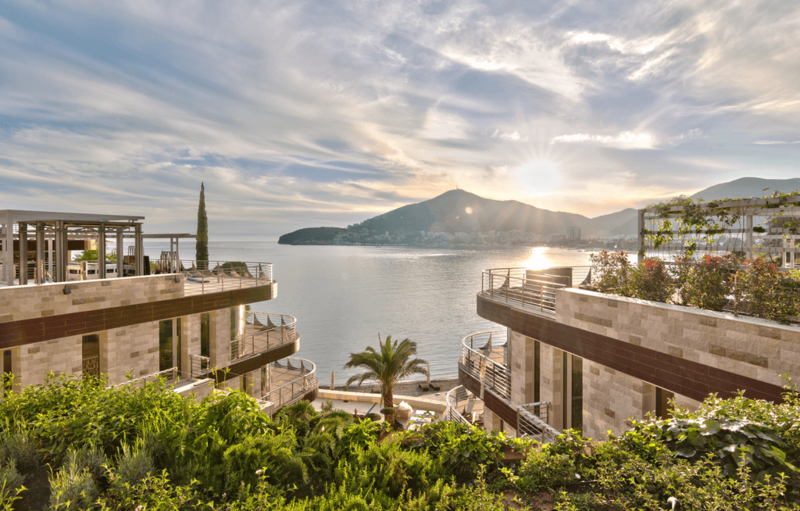 With over 20 years’ experience both in the United States and Montenegro, Milorad can help you navigate the complex property-buying process in Montenegro. He can help you avoid the common pitfalls of buying property as a foreigner in Montenegro, take advantage of the benefits and find your dream home here.